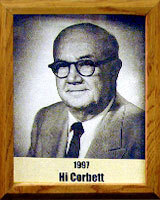 Hiram “Hi” Corbett was born in Tucson in 1885. He championed the cause of the University of Arizona as he wanted to see it become Internationally recognized as a center for education and research. He was a very successful businessman (Lumber Yard). He was a promoter for the City of Tucson and Southern Arizona. In 1945 he brought the Tucson Open to the community. In 1947 he would bring the Cleveland Indians to Tucson for spring baseball training. The city of Tucson honored him in 1928, when they declared Hi Corbett Field (Baseball) in his honor.